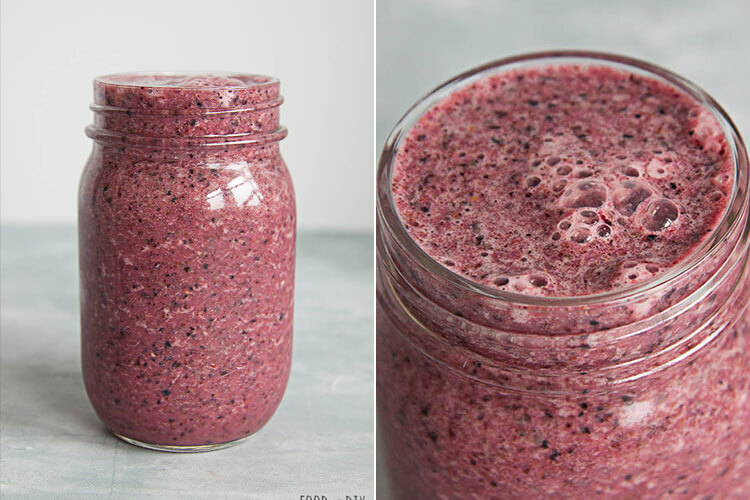 This smoothie recipe is creamy and bursting with blueberry and pineapple flavor. With only 5 ingredients it takes less than 5 minutes to make, making it the perfect on-the-go breakfast or snack! But lately, I’ve been playing around with making my own smoothies and even with my less than steller blender I’ve made some pretty delicious smoothies. I’ll be posting more of them soon. I’m hoping to get a better blender soon. 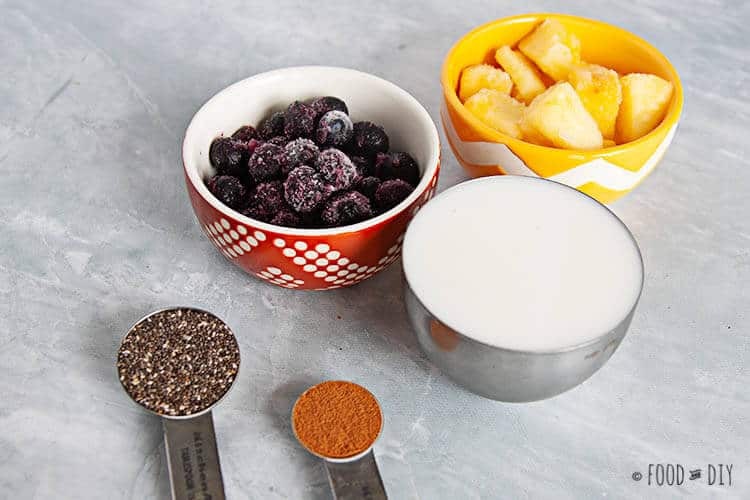 All you need is 1 cup of frozen blueberries, 1 cup of frozen pineapple chunks, 1 tablespoon of chia seeds, 1 tsp cinnamon, and 1-1 1/2 cups milk of your choice. I used unsweetened almond milk. Throw everything in the blender and blender until smooth! If needed you can adjust the amount of liquid depending on if you like your smoothies thicker or thinner. I like to easily be able to drink my smoothies with a thinner straw so I make mine on the thinner side. 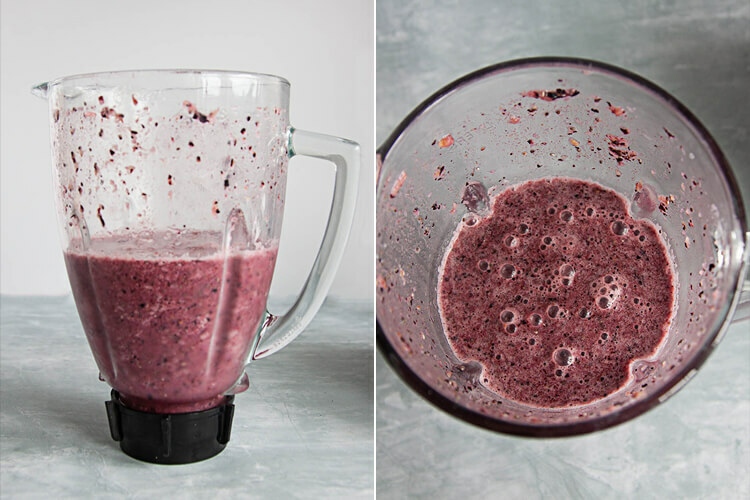 Pour your smoothie into your favorite cup/glass/mug/jar and enjoy! Doesn’t this look delicious? Do you like smoothies? Do you prefer them to be thick or on the thinner side? Tell me in the comment below! Blend on high for several seconds to minutes (depending on what kind of blender you have). If the smoothie is too thick or you like thinner smoothies you can also add up to 1 cup of water! What a terrific combo in a smoothie recipe, packed with flavours and nutrition in a glass! Perfect for a healthy start in the new year! Pinned! My daughter can’t wait to try this! I love the combination of blueberries and pineapple in smoothies, and I haven’t had a smoothie with pineapple in it in ages thanks for the reminder! I drink a smooth almost every single morning and NEVER thought to combine blueberry and pineapple! What a yummy combo! Right?!?! It’s a great combo!! Now that is an amazing combination. of two of my favorite fruits. I love pineapple very much as well as blueberry but I have not tried them together. Looks yum. I love smoothies! This fruit combo sounds so yummy too! I can’t wait to try it. Thank you for sharing! This recipe jumped out at me right away, because the combination of blueberry and pineapple seemed both really unique and also so delicious! 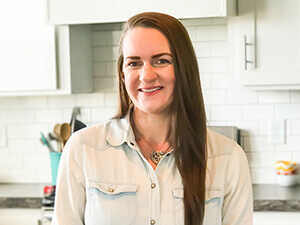 Plus – you know – I’m such a fan of anything with “bonus” healthy ingredients mixed into a recipe that’s so delicious nobody really even notices it’s health-ified. So, yay for those bonus chia seeds and even antioxidant-rich cinnamon! Definitely winning! 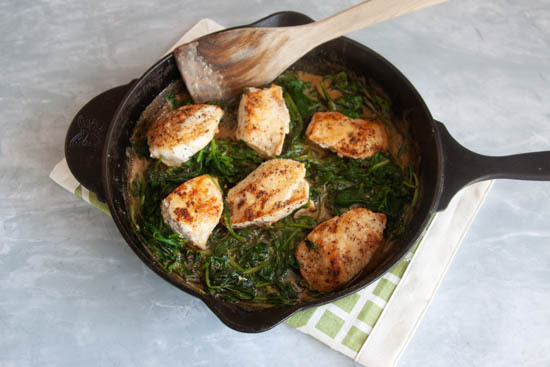 And definitely the perfect recipe for kicking off healthy New Year’s resolutions. Thanks bunches – pinning for sure! Thanks so much! Yes! Perfect for New Years healthy eating! I love smoothies! Such a quick and easy breakfast or snack! This one sounds fantastic! Yes! I think I love them more as a snack than breakfast but they are definitely good either way! Pineapple blueberry is one of my favorite smoothie combos! I haven’t tried with cinnamon and chia seeds though – great idea! Thanks! Just gives it a bit more nutritional value! I’ve never had blueberries and pineapples in a smoothie! That looks so delicious and refreshing! I love the combination of blueberries and pineapples. This sounds perfect and can’t wait to try this for a healthy snack. Awesome! I hope you love it!